You have to rub the wall using a sandpaper that is packed with your product to remove coating film of the silk wallpaper. If you want to stick your product more firmly, you should use silicon. Box, Wall clock and fittings. Do not use on cracking, bending, or special material wallpaper. If you have silk wallpaper, you should remove a part of the coating with sandpaper or a sponge. 2. You can choose to use self-fusing silicon tape depending on the shape or state of the wallpaper, but we are not responsible for any damages done to the wallpaper. Check that the hour and minute hands of the clock are not bent. If the clock hands are bent, the clock may malfunction. Our newly designed products’ hands are set to 12 o’clock in order to prevent them from moving as they get delivered. Our products function very silently. The hands of the clock will not move immediately if there is no “seconds” hand. Therefore, you should check back after 10 minutes. 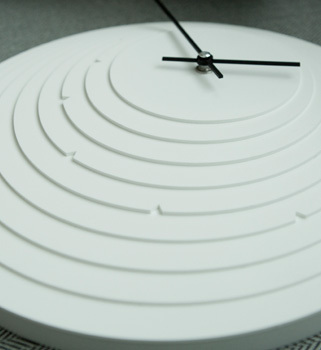 Handcrafted stylish designing and different clock schemes meet all your home decoration need. Quiet Wall Clock and absolutely quiet environment.